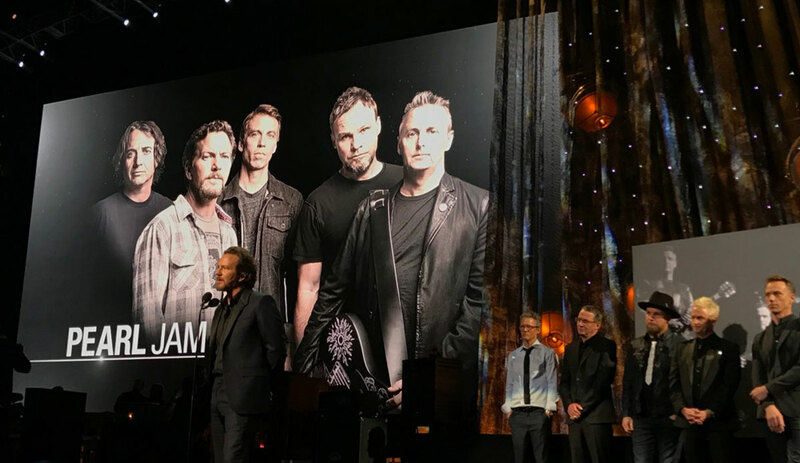 Seattle rockers Pearl Jam, the late rapper Tupac Shakur and 1970s hitmaking band Journey were inducted into the Rock and Roll Hall of Fame on Friday night. Joan Baez, Electric Light Orchestra and Yes were also part of the 2017 class inducted at the Barclays Center in Brooklyn, New York, which kicked off with a tribute to Chuck Berry. The new inductees closed the multi-hour event with a group performance, and before that Pearl Jam electrified with a performance of its well-known songs. David Letterman inducted the band, and brought a small guitar and letter onstage that he said Vedder gave to his son days before his late-night show ended in 2015. His wife, Jill, was teary-eyed in the audience as fans continued to cheer. Vedder also used his speech to discuss climate change, saying “climate change is real, that’s not fake news.” He also said his daughter Olivia was a big fan of Chance the Rapper, and thanked the Grammy-winning hip-hop star for his charitable contributions to Chicago. Speaking of rappers, Shakur – who died in 1996 – was remembered by Snoop Dogg with a touching and playful speech. Perry, estranged from the band for many years, did embrace guitarist and co-founder Neal Schon onstage. Baez, one of folk’s most iconic voices, said it felt “cool” to be inducted. She also said earning the Rock Hall honor would help young people learn who she is, and what she’s accomplished. She was inducted by Jackson Browne, who said the first album he bought with his own money was Baez’s second album. ELO – who kicked off the show with Berry’s “Roll Over Beethoven” – and progressive British rockers Yes were also inducted Friday. Berry wasn’t the only late legend who was honored: Lenny Kravitz paid tribute to Prince after the “In Memoriam” section with an explosive performance of “When Doves Cry,” backed by a choir and beaming purple lights. Pharrell said kind words about Nile Rodgers, who received a special honor at the event, which will air April 29 as a special on HBO. Rock and Roll Hall of Fame Class 2017: Pearl Jam, the late rapper Tupac Shakur, 1970s hitmaking band Journey, Joan Baez, Electric Light Orchestra and Yes.